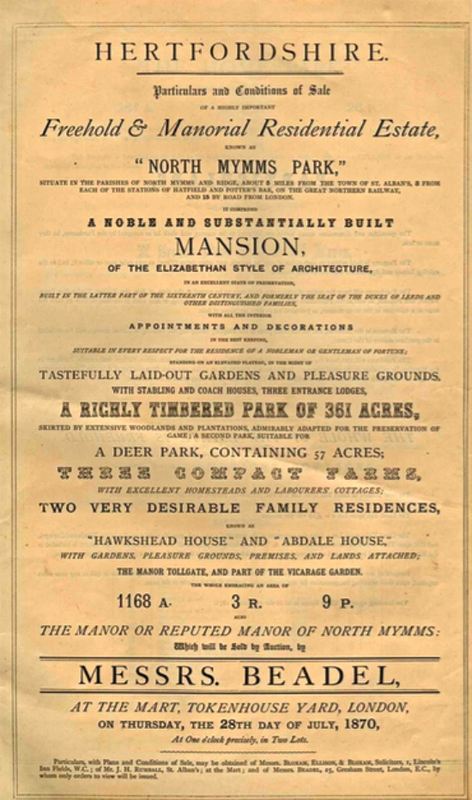 The 1870 auction brochure for North Mymms Park has been loaned to this site by local historian and archivist Peter Miller so that it can be uploaded for others to view. The sale included Hawkshead House, Abdale House, the Manor Tollgate, 361 acres of timbered park, a 57 acre deer park, three compact farms with "excellent homesteads and labourers cottages" totalling 1168 acres. Also in the sale was The Home Park at 57 acres including six "substantial" cottages, and The Wood Lands, 234 acres, including four "commodious" cottages. A PDF of the brochure, which you can download and print, is below.